Pregnant at seventeen, Sinéad McLoughlin does the only thing she can; she runs away from home. She will go to England and put her child up for adoption. But when she lays eyes on it for the first time, lays eyes on him, she knows she can never let him go. Just one problem. He’s already been promised to someone else. 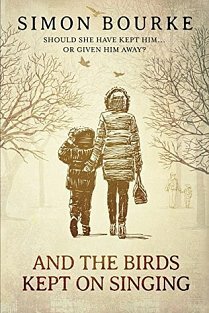 A tale of love and loss, remorse and redemption, And the Birds Kept On Singing tells two stories, both about the same boy. In one Sinéad keeps her son and returns home to her parents, to nineteen-eighties Ireland and life as a single mother. In the other she gives him away, to the Philliskirks, Malcolm and Margaret, knowing that they can give him the kind of life she never could. As her son progresses through childhood and becomes a young man, Sinéad is forced to face the consequences of her decision. Did she do the right thing? Should she have kept him, or given him away? And will she spend the rest of her life regretting the choices she has made? I don’t think I have read any book where the author so well gets into the heads of the characters and allows the reader to see life as they do and feel the emotions as they do. Simon Bourke gives a tremendous voice to Seán, in particular, as a young child, an older boy, a teenager and a young adult. We live with him during his insecurities, his naughtiness, his daydreaming and fantasies, his thought processes, his growing up and his relationships with family, mates, girls, drink and drugs. His internal dialogues and imagined conversations are a joy to read. Bourke’s writing of these passages is outstandingly good and spot on for the age and development of the character. The other characters are treated similarly, but in less depth, except perhaps for Jonathan as a young child. The stories are parallel timelines for the same main character: in one story arc Seán lives with his mother Sinéad in the Republic of Ireland, and in the other he is brought up as Jonathan in England after being adopted as a baby in the early 1980s by Margaret and Malcolm. There is so much scope here for exploring nature versus nurture and I feel that this was a missed opportunity. The storyline for Seán is the stronger one – he is a terrific character: funny, quick-witted and independent. Jonathan is all of these things, but toned down somewhat and his story is interrupted by that of his parents. The young Seán’s/Jonathan’s narration is quite charming, but be aware that later there is a lot of swearing and some quite graphic scenes (appropriate and necessary, but not what everyone will want to read). The book is not without its flaws (explored more under “Editorial input”), but its nearly 600 pages are well worth reading for the emotions it will stir in the reader. It is funny (in a dry, understated way), insightful, immensely sad in places, nostalgic, thought-proving and entertaining. Bourke’s characterisations are masterful and I am ready to devour whatever he writes next. This book has clearly had professional input. There are a few proofreading misses but certainly no more than are acceptable in a book of this length. The structure of the book doesn’t quite work. At first there are a few chapters of one story and then a few of the other, then later there is a large chunk of Seán’s story followed by a large chunk of Jonathan’s. I found this confusing and the times don’t quite run parallel. The structure is probably a case of ask ten different editors and get ten different answers – my suggestion, though, would be to have a prologue giving Sinéad’s and Margaret and Malcolm’s initial stories, and then split the book into two: Seán’s story and then Jonathan’s story from their points of view only. I would also suggest some anchor points between the two stories, such as the odd reference to a song in the charts or a world event, perhaps mentioned in one story by Sinéad and in the other by Margaret. Children’s toilet humour is similar however they are brought up, so Jonathan’s bathroom scene could have been mirrored in Seán’s timeline also. In Jonathan’s story Nan McLoughlin has bad arthritis and this could be mentioned in Seán’s story too. I would definitely have suggested looking a little more at nature versus nurture. I would have included a few more similarities between Seán and Jonathan. For example, Jonathan was a potential world-class runner, but it was never mentioned that Seán could run fast – this would be an innate talent, so it could have been implied that Seán could out-run his mates or won races at school sports days, but his talent was overlooked, whereas once Jonathan showed an aptitude for running he was given a personal trainer. Both boys could have supported the same football club, even attended a particular match (Jonathan taken by his father, Seán bunking off school and going without permission). Both boys could have liked the same band – maybe Jonathan could have seen them live in Manchester and Seán seen them in Cork; or Seán may have liked house music because of listening to it with his mates and Jonathan was steered towards classical music because his parents thought it would be appropriate. It could be mentioned that both boys like similar foods or are attracted to the same type of girl. The boys could have had a similar inherited mannerism, and Jonathan another mannerism picked up from Malcolm. The points of view of the main characters is startlingly brilliant. However, the POV overall is a little muddled. We predominantly see things in third person through the main characters’ eyes, but every now and again we get someone else’s POV, even some head-hopping. I found this jolted me out of the story. I think this is a case where “killing your darlings” would have benefited the story – it would have tightened up and shortened slightly the book; some beautiful lines would have been lost but for the greater good. Keeping the stories to Seán’s and Jonathan’s POVs would also mean losing some parts of the adults’ stories. I think it would have been worth it for the overall tightening, though. Much of what we need to know could be imparted through actions of the secondary characters as seen through the eyes of the main ones (even if the children don’t understand what was going on) and this would both shorten and enliven the story. We don’t really need to know the full stories of the adults. I think there is too long a build-up to some of the conflict and would have suggested the author revisit some parts of the book to introduce a small amount of conflict earlier on. Seán’s story ends rather abruptly, and Jonathan’s ends in a rushed manner. I would have suggested the author look at these again. I would highly recommend that writers read this book for a craft lesson in getting inside your characters’ heads. I am immensely impressed with Bourke’s mastery of this aspect of writing, especially in a first novel. Cover: Gorgeous and atmospheric. The title has relevance to Seán’s story, and it would have been nice to have a reference to the phrase in Jonathan’s story too. The line in the blurb “Just one problem. He’s already been promised to someone else” isn’t followed through as a story line. The quality of the cover is typical Create Space. Internal design: I read this partly on a Kindle and partly as a paperback. I didn’t have issues with either. Definitely a good read for a book club. It will spark lots of conversation and debate. Be aware though that there is a lot of swearing and some quite graphic scenes in it. Refreshments could be crispy pancakes and Schnapps. What others are saying: Amazon UK readers give it 5 stars (12 reviewers); Amazon US readers give it 5 stars (1 reviewer); Goodreads readers give it 4.2 stars (5 ratings).